Always striving to bring the latest and greatest cutting edge treatments to our patients, The SPA at The SHAW Center is the first plastic surgery practice in the Valley to offer brand new PicoSure tattoo removal! If you’ve been wanting to get rid of your tattoo or have tried and were unsuccessful in the past, this treatment is for you. So what makes the PicoSure Laser stand out from its competitors? Here’s the scoop on the laser’s skin-perfecting results that will leave you regret-free. Half the treatments: PicoSure uses PressureWave™ technology which delivers short pulses of energy to shatter tattoo ink and skin spots. This means 50% fewer treatments thanother lasers. Win, win. Less downtime: Not only does PicoSure require less treatments, recovery time is shorter which means you can have treatments performed closer together making your tattoo disappear in record time. No color is safe: The multiple wavelengths of the PicoSure laser targets difficult ink colors – even blue and green. Veteran regretters welcome: With new technology, even tattoos that have been previously treated (unsuccessfully) can be re-treated. Groundbreaking technology of the laser causes ink particles to break down into tiny fragments, which are then naturally eliminated by the body. What are you waiting for? 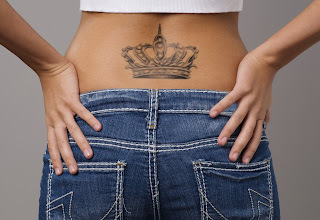 Make your old tattoo a thing of the past by scheduling your consultation today by calling 480.767.1900.